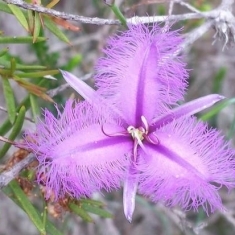 This sentiment is shared by many residents of Bundeena and with it comes a sense of responsibility to protect the local environment. 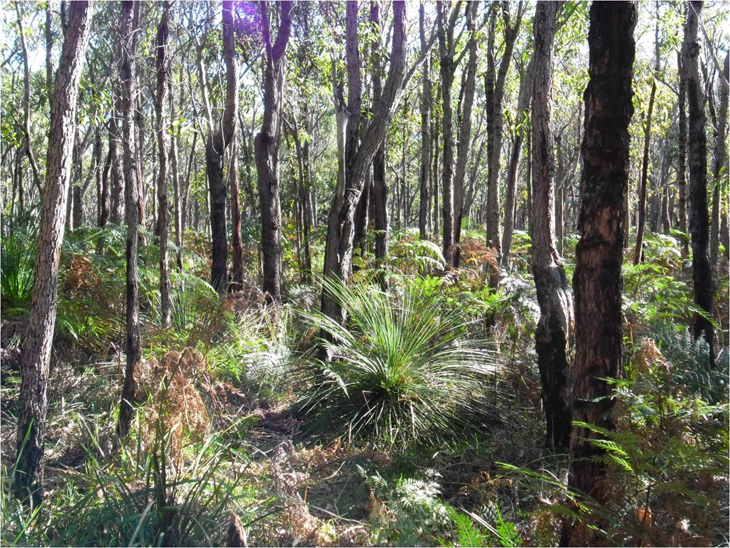 In June 2013, 5.6 hectares of bushland, or the “Scout Land” as it was previously known fell into the hands of a private developer. 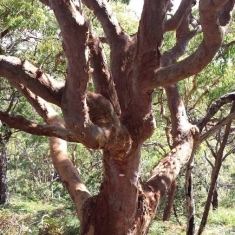 Local residents are still trying to understand the motive behind the decision of Scouts NSW to sell this land to a developer rather than accept a community buy-back. The former Scout land has no road access and is indistinguishable from the surrounding National Park. 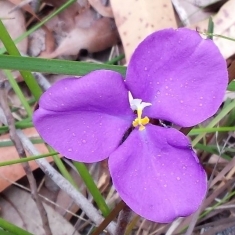 It lies within the greater area known as Spring Gully, which lies within the Royal National Park (figure 1). 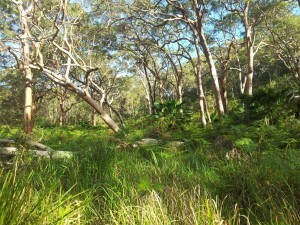 The land was given to Scouts NSW in the 1960s for community use. It has never been cleared, built on or used for any purpose. For all intents and purposes the land belonged to the public and has remained effectively conserved to this day. 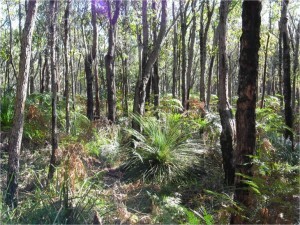 When Scouts NSW listed the property for sale in February 2013, members of the local community formed the Spring Gully Protection Group to purchase the land for donation to the Royal National Park. 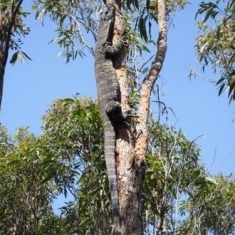 The group joined with the Foundation for National Parks and Wildlife, an independent non-profit organisation which acquires high conservation-value land to donate to Australia’s publicly owned national parks and protected areas. They were willing to negotiate with National Parks and Wildlife Service (NPWS) and Scouts. The foundation sought to negotiate the purchase of the land on behalf of the local community. The Scouts, however, declined the offer from the foundation and chose to sell the land to a private party for reportedly $25,000 more than the foundation’s final offer of $300,000. 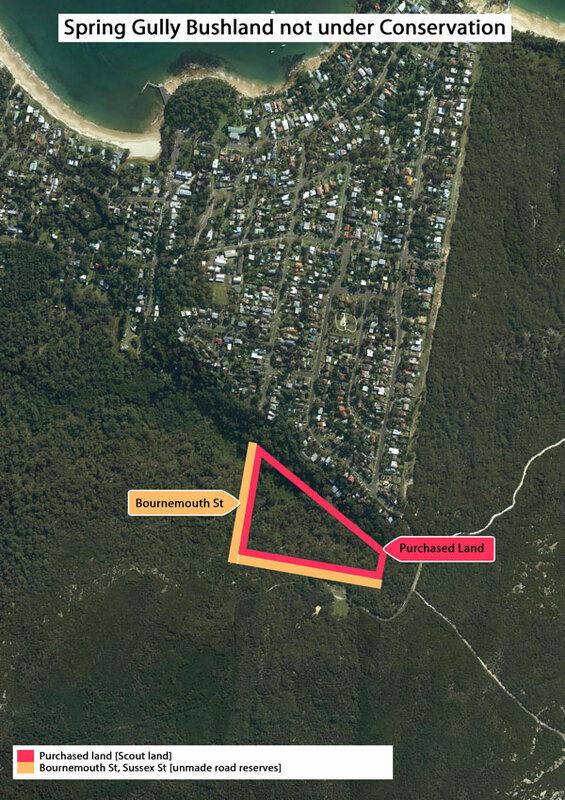 The property contributes approximately 7% to the total land area of Bundeena, yet the NSW Valuer General values the land at $27,500, a valuation reflecting historical and future development potential. 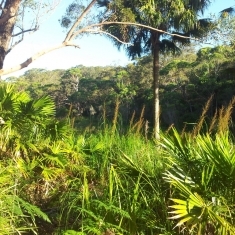 It was also made clear to all prospective buyers, including the Spring Gully Protection Group, that the land has limited development potential and would be subject to possible rezoning later in the year due to the 2013 Sutherland Shire Council draft local environmental plan (LEP). 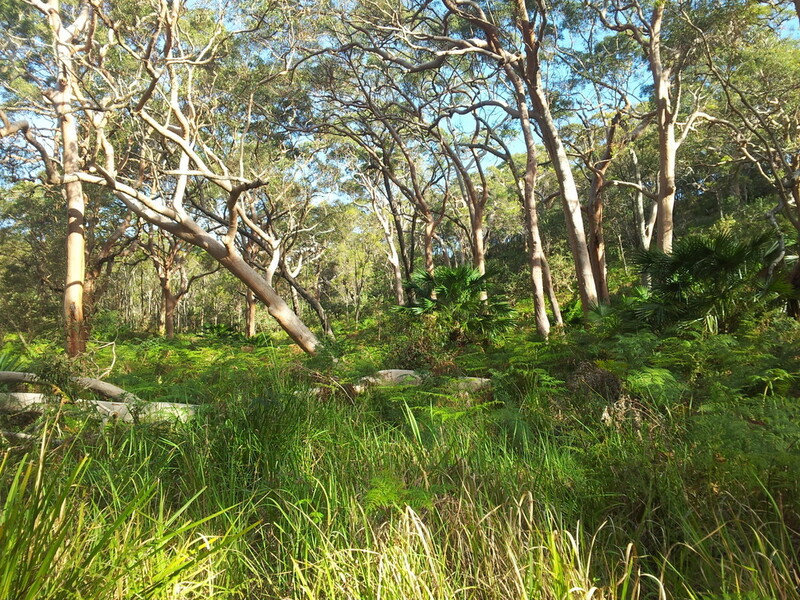 The draft Sutherland Shire Council LEP proposes to zone the land E2 (environmental conservation) with additional permissible uses “recreation camp” and “eco-tourism”. These additional clauses will allow the building of conference and function centres, spiritual retreats, recreation and sporting facilities. Council’s definition of “recreation camp” in the LEP is so broad that a motel, hotel or holiday resort could meet the definition. 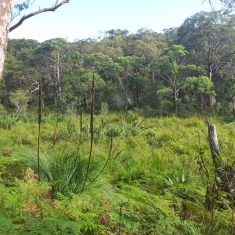 The Spring Gully Protection Group believes that the scope of these permissible uses is too broad for this pristine bushland setting and will encourage inappropriate future development. 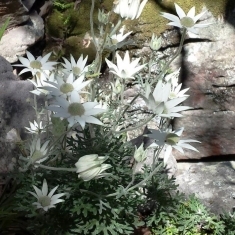 The group is also concerned that a loop-hole could be exploited by zoning environmentally sensitive land with the additional permissible use “eco-tourism”; it allows for a residential house that otherwise would never be permitted on a sensitive environmental site. Upon DA approval, the development may or may not continue as a tourist facility. However, a residential house will remain forever. 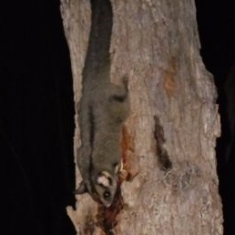 This loophole was exploited by the “Coledale Rainforest Retreat” and others. Under the Rural Fire Service building code for bushfire prone land, any development of this land will require up to 2.5 hectares (6 acres) of the forest to be cleared for an asset protection zone (APZ), due to the challenging geography, steep slope and isolation from the road system. 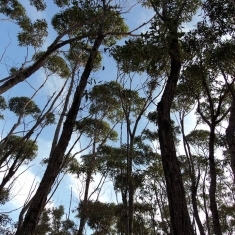 Only 15% of the tree canopy is allowed to remain within an APZ – less tree cover than Redfern. 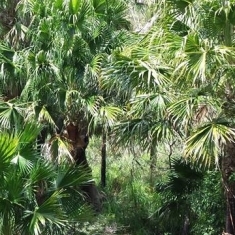 A substantial amount of the forest understory would also need to be removed. The APZ would extend into the threatened species buffer zone around the wetland, which is in conflict with the stated objectives of E2 (environmental conservation) zoning. Destroying the very thing that people are coming to see is at odds with any definition of an eco-tourism facility. 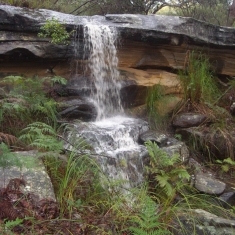 The Coast Track is the most visited walk in the Royal National Park and is being promoted as a “national landscape”. 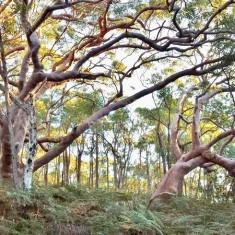 The Royal National Park is also being nominated for World Heritage listing. This is an endeavour that the NSW State Government, Sutherland Shire Council and Wollongong Council all officially support. Widespread clearing for development in the vicinity of the Coast Track will degrade the beauty of the Royal National Park. The scar on the landscape will also be visible from many streets in Bundeena, on approach to Bundeena via Bundeena Drive and on approach to the Coast Track via Eric Street. 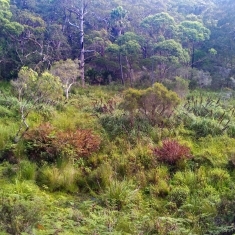 The land is classified by council as “greenweb core habitat” with threatened species and endangered ecological communities: Spring Gully contains habitat for several vulnerable species including the eastern pygmy possum, sooty owl, powerful owl and the grey-headed flying fox. 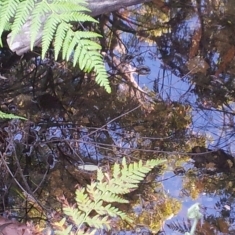 The “Sydney freshwater wetland” on site is an endangered ecological community and will be degraded by clearing a large area of the forest canopy and undergrowth. This riparian habitat would also be adversely affected should subdivision of this land be permitted. 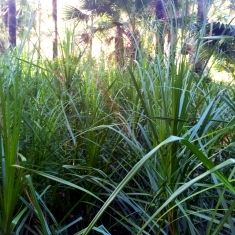 Removal of canopy and undergrowth will cause sand dune slippage and siltation in the wetland. 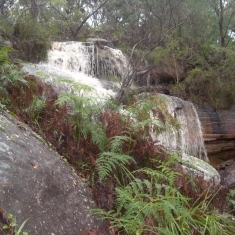 Bundeena Creek will suffer from slower flows and more stagnant pools. 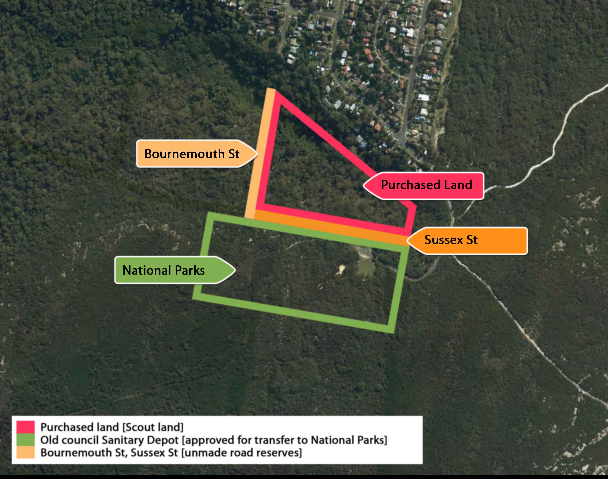 The old council sanitation depot is currently being transferred from Sutherland Shire Council to NPWS for inclusion in the Royal National Park. NPWS have stated that all existing gazetted roads in the area should be included in this transfer, including the unmade road reserves of Sussex Street and Bournemouth Street that border the Scout land. Council propose to zone the Sussex Street paper road as E2 (environmental conservation) due to its known environmental significance. 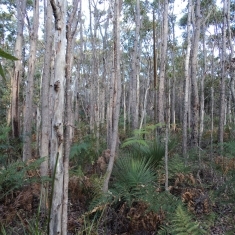 Sussex Street is situated on a ridgeline and is heavily forested with a significant and old stand of slow-growing bloodwood mallee (figure 2) with a dense understorey that holds the sand dune together; one of the only group of its kind growing in “Sydney sandstone gully forest” so close to the coast. These slow growing trees have risen from extensive, underground bulbous wood structures called lignotubers. 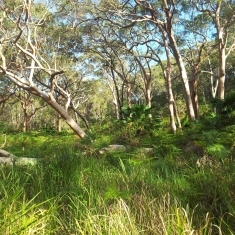 This habitat has been considered worthy of inclusion in a book proposing World Heritage listing for the Royal National Park. The current landowner has made a request to council to buy Sussex St to extend their existing land holding. 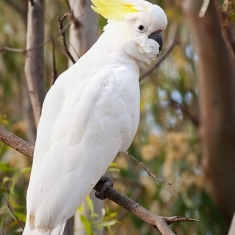 The closing date for public comment on the draft 2013 Sutherland Shire Council Local Environment Plan has been extended until the 1st November. 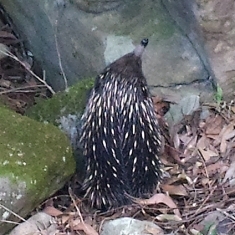 Have your say online at www.springgully.org (simply fill in your details and select the comments you wish to include). Join the mailing list at our website to receive future updates. Like the SGPG facebook page at www.facebook.com.springgullyprotectiongroup to show support.